Latin: "Et Facta Est Lux"
Founded in 1867 by William Jefferson White, an aggressive expansionary program undertaken by the college's 6th President Benjamin Mays, during the 1950s and 1960s, established Morehouse as the largest men's college in the United States, with an enrollment of over 2,000 students. The student-faculty ratio is 13:1. Along with Clark Atlanta University, Morehouse School of Medicine and nearby women's college Spelman College, Morehouse is part of the Atlanta University Center. In 1881, both Morehouse and Spelman students were studying in the basement of Atlanta's Friendship Baptist Church. Morehouse is one of two historically black colleges in the country to produce Rhodes Scholars, and it is the alma mater of many African-American community and civil leaders, including Martin Luther King Jr.
Just two years after the American Civil War, the Augusta Institute was founded by Rev. William Jefferson White, an Atlanta Baptist minister and cabinetmaker (William Jefferson White's half brother James E. Tate, was one of the founders of Atlanta University, now known as Clark Atlanta University), with the support of the Rev. Richard C. Coulter, a former slave from Atlanta, Georgia, and the Rev. Edmund Turney, organizer of the National Theological Institute for educating freedmen in Washington, D.C. The institution was founded to educate African American men in theology and education and was located in Springfield Baptist Church (Augusta, Georgia), the oldest independent black church in the United States. The institution moved from Augusta, Georgia, to Atlanta, Georgia, in 1879. The school received sponsorship from the American Baptist Home Mission Society, an organization that helped establish several historically black colleges. The Institute's first president was Rev. Joseph T. Robert (1871-1884) (father of Brigadier General Henry Martyn Robert, author of Robert's Rules of Order). An anti-slavery Baptist minister from South Carolina and 1828 graduate of Brown University, Robert raised funds, taught the classes, and stabilized the institution. In 1879, the institute moved to its own location and changed its name to the Atlanta Baptist Seminary. It later acquired a 4-acre (1.6 ha) campus in downtown Atlanta. In 1885, Samuel T. Graves became the second president. That year the seminary moved to its present location, on land donated by prominent Baptist and industrialist, John D. Rockefeller. In 1890, George Sale became the seminary's third president. In 1906 John Hope became the first African-American president and led the institution's growth in enrollment and academic stature. He envisioned an academically rigorous college that would be the antithesis to Booker T. Washington's view of agricultural and trade-focused education for African-Americans. 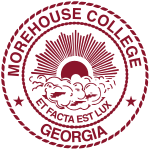 In 1913, the college was renamed Morehouse College, in honor of Henry L. Morehouse, corresponding secretary of the American Baptist Home Mission Society (who had long organized Rockefeller and the Society's support for the College). Morehouse entered into a cooperative agreement with Clark College and Spelman College in 1929 and later expanded the association to form the Atlanta University Center. Samuel H. Archer became the fifth president of the college in 1931 and selected the school colors, maroon and white, to reflect his own alma mater, Colgate University. Benjamin Mays became president in 1940. Mays, who would be a mentor to Martin Luther King Jr., presided over the growth in international enrollment and reputation. During the 1960s, Morehouse students were actively involved in the civil rights movement in Atlanta. Mays' speeches were instrumental in shaping the personal development of Morehouse students during his tenure. In 1967, Hugh M. Gloster became the seventh president. The following year, the college's Phi Beta Kappa Honors Society was founded. In 1975, Gloster established the Morehouse School of Medicine, which became independent from Morehouse College in 1981. Gloster also established a dual-degree program in engineering with the Georgia Institute of Technology, University of Michigan and Boston University. In 2007, Morehouse graduated 540 men, one of the largest classes in its history. On May 16, 2008, Joshua Packwood became the first white valedictorian to graduate in the school's 141-year history. In August 2008, Morehouse welcomed a total of 920 new students (770 freshmen and 150 transfer students) to its campus, one of the largest entering classes in the history of the school. Morehouse celebrated several historic milestones in 2013. 100 prior, in 1913, Atlanta Baptist College was renamed Morehouse College after Henry Lyman Morehouse, corresponding secretary for the American Baptist Home Mission Society. 2013 was also the 50th anniversary of the 1963 March on Washington, when Morehouse graduate the Rev. Martin Luther King Jr., class of 1948, delivered his iconic "I Have a Dream" speech in Washington, D.C. The year also marked the 50th anniversary of King's "Letter from Birmingham Jail." The College also celebrated the 25th anniversary of the "A Candle in the Dark" Gala, which honors some of the world's leaders and raises scholarship funds for Morehouse students. In May 2013, President Barack Obama became the first sitting president in three-quarters of a century to deliver a commencement address in Georgia when he took part in Morehouse College's 129th Commencement ceremony. Franklin Delano Roosevelt gave a summer commencement address at the University of Georgia in 1938. President Obama received an honorary Doctor of Laws degree from Morehouse. Morehouse's governing body is its Board of Trustees. The Morehouse Board of Trustees has 37 members, including 3 student trustees and 3 faculty trustees. As of December 2014, five of the six executive board members and seven of the 31 general trustees are Morehouse alumni. The President of the College is the senior executive officer, appointed officially by the Board of Trustees. The current President of Morehouse is John Silvanus Wilson Jr., a 1979 alumnus of Morehouse, a professor of education and the former executive director of the White House Initiative for Historically Black Colleges and Universities. The President's Office has 8 divisions within its "administrative cabinet" - Academic Affairs (headed by the Senior Vice President for Academic Affairs), General Counsel, Business and Finance, Campus Operations, Information Technology, Institutional Advancement and Student Affairs. Morehouse's majors and programs are divided into three divisions: the Division of Business Administration & Economics; the Division of Humanities and Social Sciences, and the Division of Science & Mathematics. Each division is headed by a dean. Morehouse's students are represented by two main bodies. The Morehouse Student Government Association is an executive board with 13 members who are elected annually. There is also the Campus Alliance for Student Activities (CASA), a 17-member board responsible for co-curricular planning across campus. Morehouse is also a member of the Atlanta University Center, a consortium of the historically black colleges and universities Spelman College, Clark Atlanta University, the Interdenominational Theological Center, and Morehouse School of Medicine. The AUC campuses are co-located in the city of Atlanta, which provides an opportunity for cross-registration and social intermingling amongst the students there, particularly the undergraduate population. Morehouse is located on 61 acres (25 ha) campus near downtown Atlanta. The campus operates recycling programs for paper, toner and ink jet printer cartridges to promote environmental responsibility. Archer Hall, named after the fifth president of Morehouse College, Samuel H. Archer, holds the College's recreational facilities such as its gymnasium, swimming pool, and game room. The gymnasium seats 1,000 people and was used by the College's basketball team before Franklin Forbes Arena was built. Brawley Hall, named after Benjamin Griffith Brawley, houses the college's History, English, Language, and Art departments. Brazeal Hall is a dormitory built in 1991. It housed athletes during the time of the 1996 Olympics in Atlanta. Brazeal Hall originally housed upperclassmen, though it currently serves as a freshmen dorm. Ray Charles Performing Arts Center and Aretha Robinson Music Academic Building is a 76,000-square-foot (7,100 m2) facility dedicated on September 29, 2010. Chivers Hall/Lane Hall is the cafeteria of the college. It seats 600 people and is attached to Mays Hall. The Sadie Mays lounge, named for the wife of Mays, connects Mays Hall and Chivers Hall. DuBois Hall is a freshman dorm erected in 1973, named after philosopher W.E.B. Du Bois. Forbes Arena is a 5,700 capacity seat arena, built for the 1996 Olympic Games. It is now the main gymnasium for the college's basketball team and holds many events year round. Graves Hall, named after the second president of Morehouse College, Samuel T. Graves, is an honors dormitory. When constructed in the 1880s, it was the tallest building in Atlanta. When the college relocated to the West End area, student housing, classrooms, and administration offices were all contained within the building. Hope Hall was named after John Hope, the first African American president (fourth president) of Morehouse College. When erected, it was known as the Science Building, then later the Biology Building. Through the years, the building became too small for classroom use and now holds laboratories for departments that are in other buildings. Hope Hall includes the offices of the Public Health Sciences Institute. Leadership Center houses the Business Administration and Economics departments as well as other offices. It also has a 500-seat auditorium and an executive conference center. The building was completed in 2005. Living Learning Center (LLC) was formerly known as Thurman Hall. It is one of the school's freshman dorms. Martin Luther King International Chapel/Gloster Hall was built in 1978 as the new auditorium and administration building for Morehouse College, replacing Sale and Harkness halls (Harkness is now a Clark Atlanta University structure). It is home to the Gandhi–King–Ikeda Reconciliation Institute. Mays Hall was named after the sixth president of Morehouse College, Benjamin Mays. It houses dorm rooms and is the headquarters for residence life for the college. Merrill Hall, named after Charles E. Merrill Jr., a chairman of the College's Board of Trustees, became the chemistry building. The 2000s (decade) saw Merrill Hall undergo a renovation that doubled its size. Its new corridor is called John Hopps Technology Tower, which houses the Computer Science department. Nabrit-Mapp-McBay Hall was erected in 1987. The building is also known as Bio-Chem from a plaque at the corridor stating that the building was built to house the Biology and Chemistry classrooms. It now holds the Biology department. It was named for distinguished science professors Samuel M. Nabrit, Frederick Mapp, and Henry McBay. Perdue Hall is a residences hall built around the time of the 1996 Summer Olympics. It housed athletes during the 1996 Olympic events. Robert Hall, named after Joseph T. Robert, the first president of the College, was erected to be the College's first residence hall. When built, there was a cafeteria in its basement. Today the basement houses a post office. White Hall is a freshman residence hall, named after the College's founder. Obelisk in front of King Chapel dedicated to theologian and civil rights leader Howard Thurman. A bronze statue of Martin Luther King Jr. stands at the eastern portion of the main entrance plaza of the Martin Luther King Jr. International Chapel. Inscribed in the base of the statue are the words of King. An obelisk named in honor of Howard Thurman stands at the western end of the main entrance plaza of King Chapel. The base of the Thurman Obelisk contains the remains of Thurman and his wife. The obelisk also houses a carillon. A statue of Benjamin Mays stands atop a marble monument situated in front of Graves Hall. This monument marks the graves of President Mays and his wife, Sadie Gray Mays. Behind the graves are memoirs and a time capsule set to be opened in May 2095. Hugh Morris Gloster, seventh president of Morehouse College and founder of Morehouse School of Medicine, is buried in the eastern lawn of the College's main administration building bearing his name. Morehouse College is accredited by the Commission and Colleges of the Southern Association of Colleges and Schools to award Bachelor of Arts and Bachelor of Science degrees. Students may choose from over 26 majors and may participate in the Morehouse College Honors Program which is a four-year comprehensive program providing special learning opportunities for select students of outstanding intellectual ability, high motivation, and broad interests. In 2008, the student body consisted of 2,500 black-non-Hispanic, 66 international students, 9 Hispanics, 7 white-non-Hispanics, 4 Native Americans, and 21 unidentified race or ethnicity. Morehouse College has received considerable attention as an outstanding national leader among liberal arts colleges from an array of media and ranking agencies. CNN quoted Sterling Hudson, the former dean of admissions, as saying, "Like every other college, we're interested in diversity. So, if a white student becomes interested in Morehouse - of course we are going to treat him like any other student." Morehouse sponsors "Project Identity," a federally funded program to stimulate interest among high school students to attend college. Project Identity conducts Saturday and summer programs for high school students to give minority students exposure to college academic life. Historically, Morehouse has conferred more bachelor's degrees on black males than any other institution in the nation. Historically black colleges and universities, which grant bachelor's degrees to 30 percent of the African Americans who pursue majors in science and engineering, continue to play a critical role in this regard. Since the 1989-90 academic year, the number of degrees awarded by the member institutions of The College Fund/UNCF have increased 64 percent in biology, 39 percent in mathematics, and 31 percent in physics and chemistry. At Morehouse College, more than 1/3 of graduates are in science and engineering. Morehouse received federal support to establish a Center of Excellence in Science, Mathematics and Engineering Education. The Center's mission is to increase the number of underrepresented groups pursuing careers in science, mathematics and engineering by providing scholarships and recruiting male and female high school students to participate in intensive summer programs, and by providing professional development activities and research experiences for public high school teachers. As of 2018, Morehouse is the No. 1 men's college for producing Rhodes Scholars. Morehouse is also the No. 1 institution of all types for producing the most black male Rhodes Scholars. Morehouse is No. 3 among the nation's Historically Black Colleges and Universities in the U.S. News & World Report 2019 rankings. As of 2016, Morehouse is the No. 1 baccalaureate-origin institution of black male doctorate recipients. In 2016, TrendTopper MediaBuzz College Guide ranked Morehouse as the No. 1 HBCU with the best brand. In 2019, The Alumni Factor ranked Morehouse among the best 50 colleges in the nation. Morehouse has been recognized as a Tier 1 (ranked number 143) National Liberal Arts College and as ranked number 62 in Best Undergraduate Teaching by U.S. News & World Report. Forbes magazine annually places Morehouse on its "America's Top Colleges" list. In 2015, Forbes ranked Morehouse No. 5 for "Most Entrepreneurial College"
Morehouse was also one of only four historically black colleges ranked in the top tier among the nation's Best Liberal Arts Colleges according to the U.S. News and World Reports 2011 rankings. In 2011, Morehouse received a rarely awarded grade of "A" for its overall core curriculum and was counted among the "hidden gems" in the What Will They Learn?™ project conducted by the American Council of Trustees and Alumni. In 2010, according to the Huffington Post, Morehouse ranks among America's Most Grueling Colleges due to the college's rigorous pre-medical curriculum and overall standard for excellence. Morehouse is among the top producers of Fulbright Scholars in Georgia. According to a 2007 joint publication by Newsweek and Kaplan, Inc., Morehouse College was one of the "25 Hottest Schools in America" and the "Hottest Men's College". In addition to the above rankings, in 2009 and 2010, the U.S. News reported that America's high school College Counselors ranked Morehouse College # 68 among the Best Liberal Arts Colleges in the Nation for their students. In 2008, Morehouse College was listed among 10 Great Schools for Networking by Forbes. A 2008 National Science Foundation study found that of over 3,000 colleges and universities in the U.S., Morehouse College was the fifth biggest producer of African Americans who eventually earned PhDs in the STEM fields (Science, Technology, Engineering, and Mathematics). In a 2003 study, Morehouse was ranked No. 29 by The Wall Street Journal as being one of the "Top 50 Feeder Schools" for elite graduate and professional schools . Morehouse was ranked No. 1 three times in a row (2002–2004) as the best school for African Americans for undergraduate study by Black Enterprise magazine. Morehouse College, along with other members of the Atlanta University Center, share the Robert W. Woodruff Library. Morehouse College is home to a 10,000-piece collection of original documents written by Martin Luther King Jr. (referred to as the King Collection). The set was valued by the Library of Congress as being worth between $28 to $30 million and was originally scheduled by his family to be auctioned off to the general public in 2006, but private donors in Atlanta intervened and offered a pre-auction bid at $32 million. On June 29, it was announced by Atlanta Mayor Shirley Franklin, a key catalyst in the buyout, that a new civil rights museum would be built in the city to make the documents available for research, public access and exhibits. Coca-Cola donated a land parcel valued at $10 million in order to assist with the development of the project. The collection includes King's 1964 Nobel Prize acceptance speech. Morehouse's New Student Orientation (NSO) is an eight-day experience that culminates with new students ceremoniously initiated as "Men of Morehouse." New students learn about the legacy of the college, traditions, academic divisions, the brotherhood, and the "Morehouse Mystique." These components complement academic success strategies designed to help students successfully matriculate to "Morehouse Men" (graduates). NSO is led by returning Morehouse students, staff and alumni; all new students are placed on curfew during NSO. Morehouse has 12 residence halls on campus. Approximately 60% of Morehouse students live on campus. Six residence halls are for first-year students only and five for upperclassmen. It is a tradition for students living in first-year only residence halls to compete in various friendly competitions (i.e. stroll-offs, chant-offs, pranks, fundraising, etc.) during the academic school year. In October 2009, Morehouse College initiated a campus wide attire policy that prohibits students from wearing women's clothes, jewelry on their teeth, pajamas as classroom attire, tight fitting caps or bandannas on their heads, or pants which hang below the waist at official college-sponsored events. This dress code is part of the Five Wells which holds that "Morehouse Men are Renaissance Men with a social conscience and global perspective who are Well-Read, Well-Spoken, Well-Traveled, Well-Dressed and Well-Balanced." William Bynum, vice president for Student Services was quoted by CNN as saying, "We are talking about five students who are living a gay lifestyle that is leading them to dress [in] a way we do not expect in Morehouse men." These remarks and the attire policy itself have been the source of great controversy both on and off the campus. President Franklin personally sent out an email to the schools' alumni, clarifying that the university's attire policy is not intended as an affront to effeminate men. Morehouse College offers organized and informal co-curricular activities including over 80 student organizations, varsity, club, and intramural sports, and student publications. Morehouse is a NCAA Division II school and competes in numerous sports, including football, baseball, basketball, cross country, and track & field. The Morehouse College Marching Band is known for their halftime performances which combine dance and marching with music from various genres, including rap, traditional marching band music, and pop music. They have performed at Super Bowl XXVIII, the Today Show, at Atlanta Falcons home games, and in a national commercial with Morehouse alumnus Samuel Jackson. They gave the halftime show during the 2013 NCAA Men's National Championship basketball game. Affectionately known as the "House of Funk" they march alongside Spelman's Maroon Mystique Color guard (flag spinning) squad and Mahogany-N-Motion danceline. Morehouse's debate team was formed in 1906 and has won many accolades since its founding. In 2005, Morehouse College became a member of the American Mock Trial Association (AMTA). The school is one of only four competing teams to come from a historically black college and is also the only all-male team in the AMTA. From 2006 to 2010, Morehouse consecutively won their regional championship competitions, and thus received direct trips to the AMTA national championship competitions in Iowa, Florida, and Minnesota. In 2016, Morehouse became the first HBCU, Georgia institution, and men's college chosen to host the annual U.S. Universities Debating Championship which had nearly 200 teams from across the nation participate. Founded in 1911, the Morehouse College Glee Club has a long and impressive history. The Glee Club performed at Martin Luther King Jr.'s funeral, President Jimmy Carter's inauguration, Super Bowl XXVIII, and the 1996 Summer Olympics in Atlanta. The Glee Club's international performances include tours in Africa, Russia, Poland and the Caribbean. The group also appeared on the soundtrack for the movie School Daze, directed by notable Morehouse alum (c/o 1979), Spike Lee. Most recently, the Morehouse College Glee Club was invited to perform at the ABCUSA 2011 Conference in Puerto Rico. Also, the glee club studio-recorded a song for Spike Lee's "Red Hook Summer" entitled Zachary and the Scaly-Bark Tree. The college's weekly student-run newspaper is 'The Maroon Tiger. Founded in 1898 as The Athenaeum, it was renamed in 1925. American poet and writer Thomas Dent was a contributor while he attended from 1948 to 1952, as was Martin Luther King Jr. The 2008–2009 staff sought to expand the newspaper into a news organization by creating Morehouse's first television news program, Tiger TV, and advancing online news coverage. Several Spelman College juniors that advance pass the preliminary interviews, vie for the prestigious title of Miss Maroon & White through a formal campaign and beauty pageant process during the spring semester. Only Morehouse students can vote to determine the winner which is the contestant that best represents the ideal counterpart for a "Morehouse Man." Miss Maroon & White and her royal court (two runners-ups known as attendants) collectively serve as official Morehouse ambassadors and represents the womanly embodiment of the institution for a year. The tradition of crowning a Spelman student as Miss Maroon & White began in 1936 with Miss Juanita Maxie Ponder winning the first crown. Miss Maroon & White is the longest active pageant title in the Atlanta University Center. The Tiger 6- MAA'T Chapter of Groove Phi Groove Social Fellowship, Inc. In sports, the Morehouse College Maroon Tigers are affiliated with the Southern Intercollegiate Athletic Conference (SIAC). Morehouse College competes in football, baseball, basketball, cross country, tennis, track & field and golf. The Morehouse swim team is called the Tigersharks. From 1958 till 1976 the swim team had 255 wins and only 25 losses, with over 15 SIAC championships, making it the most winning sports team in Morehouse history. It beat Emory University and Georgia Tech in dual meets in different seasons. The team also appeared in Jet and Ebony magazines, Black Sports, and Sports Illustrated throughout the 1960s and 1970s, and is presently being considered as honorary inductees into the International Swimming Hall of Fame in Ft. Lauderdale, Florida. Actor Samuel L. Jackson was once the team statistician and apprentice swimmer. Some of the swimmers had competed in NCAA and NAIA competition at various times throughout the team's history. The team was disestablished in 1976, and the funds were transferred to build the Morehouse School of Medicine,[citation needed] which separated from Morehouse in 1981. During the years of 1966 to 1970, their star butterfly swimmer was Bobby Garcia, now filmmaker Robert G. Christie (IMBD.com). His film, The Sobbing Stone, was nominated Best Feature Drama at the Sabaoth International Film Festival in Milan, Italy in 2006. A screenplay of his years at Morehouse is soon to be made into a major motion picture. In 2000, Morehouse's part-time soccer coach, Augustine Konneh (who had lobbied to have soccer elevated to varsity status two years earlier) signed two Nigerian-born players to play for the Maroon Tigers even though they had played professionally for the Atlanta Ruckus of the A-League two years earlier. They also played a few games for Morehouse before they actually enrolled at the school. Despite obvious red flags in their applications—they would have been only grade-school age when they enrolled at the University of Liberia, and one of them could not provide a transcript of his collegiate coursework—Morehouse admitted them. Even though the school's athletic director received word that the two players might have been ineligible, they were allowed to play in 2001 as well. Although Konneh was replaced as coach in 2001, numerous other violations—including a player being allowed to compete without proper paperwork—led Morehouse to cancel the 2003 season. In November 2003, the NCAA barred Morehouse from fielding a soccer team again until 2006—in effect, extending the self-imposed cancellation for an additional two seasons. It was the first multi-year shutdown of an athletic program since the NCAA adopted the "repeat violator" rules. It also slapped Morehouse with five years' probation—the longest that can be imposed under the NCAA constitution, and tied for the longest probation ever. USA Today called it the harshest penalty ever handed down to a collegiate program. The Division II infractions committee came down particularly hard on Morehouse because of a lack of institutional control; for a time the athletic department did not know the soccer program even existed. While this was Morehouse's first major infractions case, the NCAA felt compelled to impose the NCAA "death penalty" because of what it called "a complete failure" to keep the program in compliance. Soccer at Morehouse has since reverted to intramural status; school officials had planned to shutter varsity soccer for an indefinite period even before the NCAA acted. Martin Luther King Jr. delivering "I Have a Dream" at the 1963 Washington, D.C. Civil Rights March. Morehouse alumni include notable African-Americans such as: Martin Luther King Jr., theologian Howard Thurman, filmmaker Spike Lee, filmmaker Robert G. Christie (a.k.a. Bobby Garcia), actor Samuel L. Jackson, civil rights leader Julian Bond, businessman and former 2012 Republican presidential candidate Herman Cain, Secretary of Homeland Security in 2013 Jeh Johnson, University president and health care executive Albert W. Dent, NFL Referee Jerome Boger, celebrity physician Corey Hébert, U.S. Congressman Sanford D. Bishop, Gang Starr rapper Guru, Olympic gold medalist Edwin Moses, Lloyd McNeill, Jazz flutist, USPS Kwanza Stamp designer, the first recipient of Howard University's MFA Degree, former Bank of America Chairman Walter E. Massey, the first African-American mayor of Atlanta Maynard Jackson, Major League Baseball first baseman and 1969 World Series MVP Donn Clendenon, former Secretary of Health and Human Services Louis W. Sullivan, former United States Surgeon General David Satcher, entrepreneur and award-winning technologist Paul Q. Judge, keyboardist for Maroon 5 PJ Morton, author Jared Andre Sawyer Jr., Sunday Best season 7 winner Geoffrey Golden, Montgomery County Alabama Circuit Court Judge Greg Griffin  and the US Centers for Disease Control (CDC) scientist that attempted to stop the Tuskegee Syphilis Study, Bill Jenkins. According to Morehouse's own "About Us" page, Morehouse was the first historically black college to produce a Rhodes Scholar. The school's first Rhodes Scholar, Nima Warfield, was named in 1994, the second, Christopher Elders, in 2001. A third, Oluwabusayo "Topé" Folarin, was named in 2004, the fourth, Prince Abudu, was named in 2015. Morehouse has been home to eleven Fulbright Scholars. Since 1999, Morehouse has produced five Marshall Scholars, one Schwarzman Scholar, five Luce Scholars, four Watson Fellows and 2010 White House Fellow, Erich Caulfield. Previous Watson Fellows include, Craig Marberry '81, Kenneth Flowers '83 and Lynn P. Harrison III '79. Presidents Barack Obama  and Jimmy Carter hold honorary doctorates of laws from Morehouse, after giving commencement speeches. In 1990, entertainer Oprah Winfrey pledged to put 100 men through Morehouse. She made a donation to establish the "Oprah Winfrey Endowed Scholarship Fund". The school uses the fund to select deserving students based on academic achievement and financial need. Selected students are deemed "Oprah Scholars" or "Sons of Oprah". Their financial support covers most of the costs of their education including prior student debt. Recipients must maintain their grade point average and provide additional volunteer support to the community. In 2004 Oprah increased her donation by $5 million for a total donation of $12 million. The fund has since supported over 400 students. This made her the largest single donor to Morehouse. In 2011, several hundred Oprah Scholars surprised Oprah by showing up at her final TV show carrying candles to thank her for her generosity. They, in turn, pledged $300,000 to help educate future Morehouse students. ^ Hampden–Sydney College and Wabash College are the others. ^ "Facts at a Glance". Retrieved 8 December 2017. ^ "Breaking: Morehouse College names new president". ^ a b "USNews.com:America's Best Colleges 2008:Morehouse College:At a glance". USNews.com. U.S. News & World Report, L.P. Retrieved 2008-01-30. ^ a b "The SIAC.com - Morehouse College". Archived from the original on November 30, 2007. Retrieved February 8, 2008. ^ "All-Male Colleges: Only 4 Remain". ^ a b c d e f g h i j k l m n "Morehouse College". The New Georgia Encyclopedia. Georgia Humanities Council and the University of Georgia Press. Retrieved 2008-01-30. ^ a b Brawley, Benjamin (1917). History of Morehouse College. Atlanta: Morehouse College. pp. 135–141. ^ "Morehouse College Fact Book 2004-2008" (PDF). p. 7. Archived from the original (PDF) on 2010-05-27. Retrieved 2010-10-11. ^ "Morehouse Graduates Largest Class". Archived from the original on September 27, 2008. ^ "White valedictorian: A first for historically black Morehouse". CNN. 2008-05-16. Archived from the original on 2008-05-19. Retrieved 2008-05-16. ^ a b "Remarks by the President at Morehouse College Commencement Ceremony". Transcript. Office of the Press Secretary, The White House. 19 May 2013. Retrieved 20 May 2013. ^ "Campus Operations - Recycling Program". Morehouse College. Archived from the original on 2008-12-06. Retrieved 2010-10-11. ^ "Morehouse Cuts the Ribbon on the Ray Charles Performing Arts Center and Music Academic Building". Morehouse College. Archived from the original on 2010-10-17. Retrieved 2010-10-11. ^ "Morehouse College Fact Book 2004–2008" (PDF). p. 27. Archived from the original (PDF) on 2010-05-27. Retrieved 2013-02-13. ^ "Project Identity". Morehouse College. Retrieved 2010-10-10. ^ "Freshmen Requirements". Morehouse College. Archived from the original on 2010-11-29. Retrieved 2010-10-10. ^ a b "Morehouse College". Archived from the original on 2015-05-13. Retrieved 2015-05-03. ^ a b "Morehouse College Senior Selected to 2016 International Rhodes Scholar Class ‹ Morehouse College News Center". Archived from the original on 2015-12-22. Retrieved 2015-12-20. ^ a b "Home - The Rhodes Scholarships" (PDF). www.rhodesscholar.org. ^ "Historically Black Colleges and Universities Ranking - Rankings - US News Best Colleges". ^ College, Morehouse. "Morehouse College - Fact Book". Archived from the original on 2015-05-12. Retrieved 2015-05-03. ^ "TrendTopper MediaBuzz – The Global Language Monitor". Archived from the original on 2016-06-12. Retrieved 2016-04-25. ^ "The Alumni Factor". www.alumnifactor.com. ^ "2017 Best National Liberal Arts Colleges". US News. US News. ^ Chen, Liyan. "5 Morehouse College - pg.5". Forbes. ^ "Hidden Gems -- What Will They Learn?". American Council of Trustees and Alumni. Retrieved 2012-02-25. ^ "Role of HBCUs as Baccalaureate-Origin Institutions of Black S&E Doctorate Recipients". National Science Foundation. Archived from the original on 16 February 2013. Retrieved 2 December 2012. ^ Bernstein, Elizabeth. "Want to Go To Harvard Law?". Wall Street Journal Classroom Edition. Dow Jones & Company. ^ "Morehouse Ranks Among Top Feeder Schools to Elite Graduate Programs". The Black Excel Newsletter. October 2003. ^ "Morehouse is No. 1 out of top 50 schools for African Americans". morehouse.edu. Archived from the original on 2006-07-08. Retrieved 2006-06-15. ^ "Atlanta Deal for King Papers Paves Way for Museum, Mayor Says". bloomberg.com. 2006-06-29. Retrieved 2006-06-29. ^ "The King Papers at Morehouse College". morehouse.edu. Archived from the original on 2006-09-01. Retrieved 2006-06-29. ^ "New Home for King Papers". Inside Higher Ed. Retrieved 2006-06-29. ^ College, Morehouse. "Morehouse College - New Student Orientation". ^ Freedman, Samuel G. (21 August 2015). "Parents' Ceremony Serves Up Elements of 'Morehouse Gospel'" – via NYTimes.com. ^ "The Soul of Morehouse and the Future of the Mystique: President's Town Hall Meeting" Archived 2013-06-01 at the Wayback Machine (Robert M. Franklin (2009)). ^ Mungin, Lateef (October 17, 2009). "All-male college cracks down on cross-dressing". CNN. Retrieved 2010-01-19. ^ "Morehouse Responds to Dress Code Controversy". Archived from the original on November 2, 2009. Retrieved February 13, 2013. ^ a b "USNews.com:America's Best Colleges 2008:Morehouse College:Campus Life". USNews.com. 2008 U.S. News & World Report, L.P. Retrieved 2008-01-30. ^ "Capital One Quicksilver TV Spot, 'Marching Band' Feat. Samuel L. Jackson". ^ "Team Numbers". American Mock Trial Association. Archived from the original on 2007-04-02. Retrieved 2007-04-07. ^ "Tournament News : Des Moines Results". Perjuries.com. Archived from the original on January 11, 2006. Retrieved 2007-04-07. ^ Chen, Celeste Headlee, Linda. "Morehouse First HBCU To Host USU Debating Championship". ^ "Tom Dent Bio : Nathanielturner.com". ^ "*MH Mag.Wntr04.9999" (PDF). Retrieved 2018-04-16. ^ "About Us". Archived from the original on 2010-09-13. Retrieved 2010-10-10. ^ "Bill Jenkins, Who Tried to Halt Tuskegee Syphilis Study, Dies at 73". ^ "Morehouse Student Named Rhodes Scholar". Morehouse College News. 2001-12-10. Archived from the original on 2006-07-20. Retrieved 2006-06-15. ^ Black Past Remembered Retrieved on 2011-02-10. ^ "Read President Obama's Commencement Address at Morehouse College". Time. Retrieved 2018-03-15. ^ "Columbus Man Credits Oprah For College Education". 24 May 2011. ^ "Local Oprah Scholar on final show". Archived from the original on 2015-10-04. Retrieved 2015-09-06. ^ "Oprah Gives Morehouse$5 Million". ^ cmaadmin (27 May 2011). "Oprah's Generosity Spurs Past Morehouse Scholarship Recipients to Pledge New Scholarship Funding". ^ "Lawrence Carter | The HistoryMakers". www.thehistorymakers.com. Retrieved 2017-04-19. ^ College, Morehouse. "Morehouse College - Peace Programs". www.morehouse.edu. Archived from the original on 2018-06-25. Retrieved 25 June 2018. ^ "IIS Governor Receives Prestigious Gandhi King Ikeda Award for Peace - The Institute of Ismaili Studies". iis.ac.uk. Retrieved 25 June 2018. ^ "Morehouse College". www.morehouse.edu. Archived from the original on 2017-12-14. Retrieved 25 June 2018.